I would like to start by wishing you all a Happy and Prosperous 2011. My name is Denis Lillie. 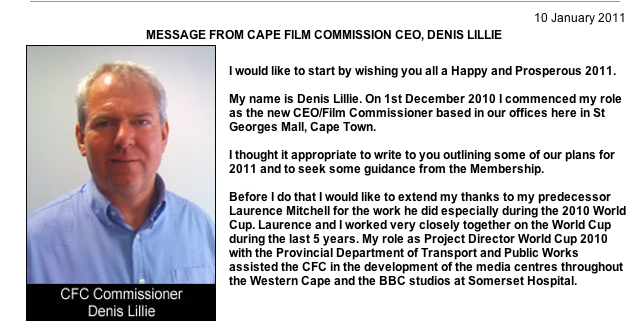 On 1st December 2010 I commenced my role as the new CEO/Film Commissioner based in our offices here in St Georges Mall, Cape Town. I thought it appropriate to write to you outlining some of our plans for 2011 and to seek some guidance from the Membership. Before I do that I would like to extend my thanks to my predecessor Laurence Mitchell for the work he did especially during the 2010 World Cup. Laurence and I worked very closely together on the World Cup during the last 5 years. 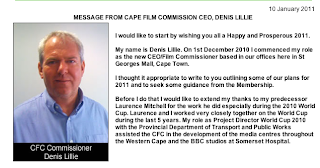 My role as Project Director World Cup 2010 with the Provincial Department of Transport and Public Works assisted the CFC in the development of the media centres throughout the Western Cape and the BBC studios at Somerset Hospital. I would also like to extend my thanks and gratitude to Tahir Fayker and Vuyokazi Matu for the sterling work they did in holding the CFC together during the time between Laurence leaving and my arrival. Since my arrival at the CFC I have received many questions ranging from “What does the CFC do?” to “What are your plans for the CFC?” and somewhere in between those questions there have been comments relating to certain sectors who are concerned that we are not representing them with sufficient vigour or responding to their needs appropriately. Let me be clear. Amongst other things, my mandate is to assist the industry, promote the Western Cape as a Film Destination and to promote film in all of its forms as a future for job creation and economic development. This is what we do! However, the CFC may not be addressing all of your concerns and issues in a way that you would like it to. I am therefore asking you all to make constructive suggestions as to what you would like to see from the CFC. What services do you need? How can we assist you more and where do you see our key strengths for promotion of the industry and The Western Cape as a destination? Please forward your comments and suggestions (politely please) to mark@capefilmcommission.co.za before the end of January and we will compile those suggestions, review them, present them to the Board and advise you on how we will be implementing those that are appropriate within our mandate. You will soon be receiving a membership number. This is intended as a tracking and registering device to ensure we are managing our database and communications more effectively. It will also assist us in future developments in relation to your needs. We will also be initiating a Help Desk through an e-mail address and dedicated phone line which will allow us to deal with and record any issues members may have in relation to elements such as Permits and Locations. You will be hearing more on this in the next few weeks. We have recently been alerted to some potential issues relating to Members rights and their product. We are attempting to assist in this matter. Should you hear of any similar related matters which concern you, please contact us. This will be another matter to raise through the Help Desk referred to above. We have recently met with local independent cinema operators and are hopeful that we will be able to incorporate some emerging filmmakers and student content into an occasional viewing with a main stream movie in a local cinema. More on this later in the month. We are also hoping to establish a Master-class season. Please if you have a well-known and respected member of the media working on one of your projects, please let us know if there is an opportunity to arrange a Master-class with them. Did someone mention that Denzel Washington is coming to town? Is anyone able to approach him in this regard? As you know, we experienced some resignations recently and are trying to address Permits and Location issues in a different way. We have developed a closer working relationship with the Permit Office but there are still some frustrations on both sides. We are therefore adding a function to our web site which will be linked to the Help Desk. Once this becomes live (we hope within 2 weeks), the facility will exist for Members to mail in a concern or complaint which will then allow us to deal with it more efficiently and effectively and to formally record the concern for later analysis and review to avoid repetition in the future. South Africa has recently hosted a successful World Cup which required road closures, policing, permits and many other matters relating to the broadcast and other media. With this in mind, it should not now be too difficult to resolve the problems encountered previously with a commercial or other shoot given what we have done in June and July of last year. Let us hear from you on your challenges and see if we can assist you in resolving them permanently. We have met recently with PRASA and The City of Cape Town and have received some very encouraging news in relation to filming at the Cape Town station and Stadium. More on this next month. I am travelling to the Berlin Film Festival next month. I will be travelling through London where I have planned meetings with the British Film Council, UK Film Treaty and London Film Festival organisers. I will also be meeting with representatives of the BBC and other production companies. In Berlin the High Commission and the German Consulate are arranging various meetings for me with my counterpart Commissioners from Bavaria and elsewhere. I will also be meeting with funders. Should you be attending the BFF, please let me know and we can attempt to meet up there and possibly share some of the meeting times. As I stated at the beginning of this letter, we are here to assist but need to hear from you to ensure we are doing the right thing for you. Please don’t be shy and get in touch and let us have your thoughts. I look forward to meeting you during the course of the year.